“Both people and dogs get cataracts. Cataracts are an increased opacity, or cloudiness, of the lens of the eye, causing impaired vision,” says Dr. Bianca Martins, a veterinary ophthalmologist at the University of Illinois Veterinary Teaching Hospital in Urbana. The lens is a hard structure that sits around the mid part of the eye and aids in focusing light on the retina. The retina contains nervous tissue that receives light signals and aids in transferring these signals to the brain. Luckily, with prompt attention, cataract growth in both species can often be halted with surgery, and the damage to vision reversed. 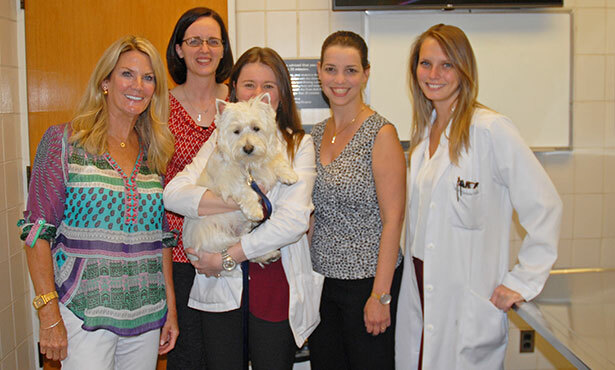 There are a few differences between human and canine cataract patients, however. “In people, vision deficits are usually noticed and attended to quickly, when cataracts are still small. In dogs, cataracts may go unnoticed until the animal is bumping into things, meaning the cataract is larger,” says Dr. Martins. 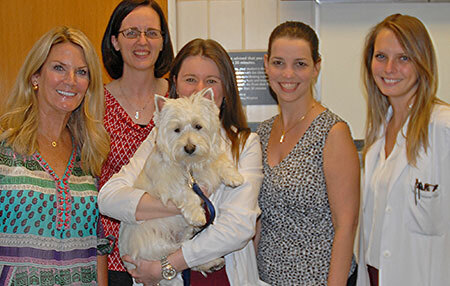 At a recheck appointment after cataract surgery on his left eye, Mickey posed with his owner (far left) and the Illinois ophthalmology team: from left, Dr. Katie Fleming, faculty; Dr. Sophie Rajotte, resident (holding Mickey); Dr. Bianca Martins, faculty; and Dr. Tatiane Villar, intern. The opacity that can be seen with the naked eye occurs because the fibers of the lens, which are well-arranged and organized in a healthy lens, become disordered, and because of a change in the lens protein content. “It is a little like the opacity that happens to egg whites with cooking,” explains Dr. Martins. Cataracts in dogs are typically inherited and appear in older animals, generally between the ages of 9 and 11. Dog breeds that are predisposed to cataracts include cocker spaniels, poodles, Boston terriers, schnauzers, Labrador retrievers, and Shih-Tzus, among others. These breeds may develop cataracts earlier in life. In other species that develop cataracts, including cats and horses, the condition usually is not inherited but instead occurs as a result of inflammation from either infectious disease or from an immune-mediated problem. “At present, surgery is the only treatment option for cataracts. Although no scientifically proven medication to remove cataracts exists, preventive medications may become a reality in the future. Right now, there is a drug being tested that is showing promise as a preventive medication for diabetic cataracts,” says Dr. Martins. Before undergoing cataract surgery, a dog must have full blood work and, if needed, a dental cleaning. The ophthalmologist will also perform an ocular ultrasound and an electrical test to make sure the retina is functional. 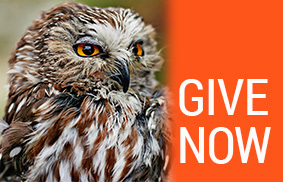 Both tests can be done while the animal is awake or lightly sedated. “If the retina is compromised, fixing the cataract in the lens will do nothing to improve the vision of the animal,” Dr. Martins explains. During surgery, a small incision is made on the cornea and the lens is removed with a small probe. Ultrasonic waves are used to break up the cataract, and it is removed. Next, the lens that was removed is replaced with an artificial lens. The incision is closed with suture material as thin as a strand of hair. If all goes well, the dog will immediately have vision after waking up from anesthesia. After surgery, pets are usually kept in the hospital overnight. They must wear a cone to keep them from scratching at the eye, and owners will be given eye drops to administer at home. Pets will need to see the veterinary ophthalmologist at regular intervals after surgery to monitor progress. Complications from cataract surgery are uncommon, but can be grave. It is possible for a small portion of the cataract to come back, likely formed from scar tissue. Often this is not enough to impair vision. As with any surgery, some inflammation is not uncommon, and it can usually be controlled. Glaucoma, which is an elevation of the eye pressure, can also develop after surgery and, if not controlled promptly, may lead to blindness. Rarely, the pet’s body may reject the artificial lens, reacting to it as a foreign body and developing inflammation. This rare but serious side effect can lead to blindness. Dr. Martins notes that a dog can still have a great life without vision, if cataract surgery is not elected, as long as there is appropriate care and monitoring to make sure the animal is not in any pain. If you have questions about cataracts, talk to your veterinarian or contact the University of Illinois Veterinary Teaching Hospital ophthalmology service.